Sweet potato consumption rose nearly 10 percent since the year 2000, according to the U.S. Department of Agriculture. And as more restaurants tout sweet potato options on their menus, at-home chefs are looking for ways to prepare the nutritious orange spud. Whether swapping standard white potatoes for sweet potatoes in a game day potato skins recipe or mashing the sweet spuds as part of a reinvented potato casserole, opportunities to incorporate sweet potatoes in home-cooked recipes are endless. Popular food blogger Jessica Segarra of TheNoviceChefBlog.com says she also enjoys stuffing sweet potatoes with unique ingredients or making homemade fries. Luckily, in today’s growing marketplace, consumers don’t have to slave away slicing and dicing. Frozen food companies like all-natural Alexia Foods offer a wide variety of premium sweet potato side dishes available at retailers nationwide. From the company’s bite-sized, crispy Sweet Potato Puffs to its innovative Sweet Potato Roll featuring 8 grams of whole grains in every roll, each of Alexia’s unique sweet potato products are made with farm-fresh, American-grown sweet potatoes and are prepared in the oven in around 20 minutes. 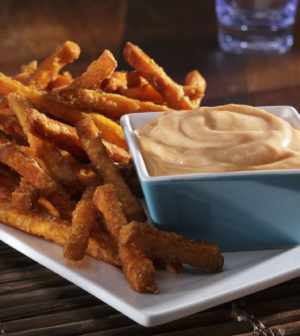 To give classic sweet potato fries like Alexia Sweet Potato Julienne Fries a kick, try serving them alongside a homemade dipping sauce like a spicy Asian dip featuring Sriracha hot sauce. Combine all ingredients in a mixing bowl. Set in refrigerator for 20 minutes to join all flavors together. Serve chilled.